These genuine celluloid guitar picks make very cool earrings. Each pair features the catchphrase "Pick Jesus" on one side, and a scripture verse on the other. So even your ears can proclaim Christ! 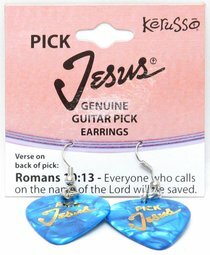 About "Guitar Pick Earrings: Pick Jesus Turquoise"
Customer Reviews For "Guitar Pick Earrings: Pick Jesus Turquoise"